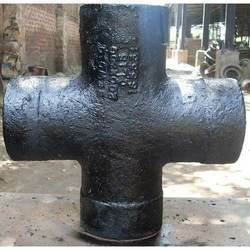 Manufacturer of a wide range of products which include plain end tee, cross fittings, plain end reducer and plain end bend. We are dedicatedly engaged in offering a commendable range of Plain End Tee. The offered tee is designed using top notch quality raw material and sophisticated technology by our adroit professionals. The provided tee is rigorously tested by our quality examiners on varied parameters so as to ensure its quality. Apart from this, offered tee is available in diversified sizes, specifications and designs as per the needs of our esteemed clients. Our in-depth knowledge and industrial expertise enable us to offer a distinguished range of Cross Fittings that are designed to be used with plain end carbon steel and stainless steel pipe. We design these fittings by using of the best quality raw material and innovative technology by our skilled professionals in line with set industry norms. Our provided fittings are tested by our quality examiners against variegated parameters. Our reputation in the market is largely attributable to our precision-designed Plain End Reducer that joins pipes of different sizes with each other. Our provided reducer is designed under the vigilance of our experienced professionals using top notch quality raw material and modern technology in adherence with set industry standards. The offered reducer is available in diversified sizes and designs as per the requirements of our esteemed clients and at market leading prices. Riding on unfathomable volumes of industrial expertise, we are offering an excellent range of Plain End Bend that is widely used in variegated industries. The offered bend is designed under the strict supervision of our adroit professionals using the best quality raw material and innovative technology in sync with industry standards. Apart from this, the provided bend is available in a varied sizes and designs in order to cater the needs of our prestigious clients. Looking for Plain Ended Fittings ?